Every quarter, our team analyzes over 12 trillion advertiser bids flowing each month through PubMatic’s platform. This allows us to observe real-time trends in the mobile space that may allude to broader digital industry trends. We then compare this information to other published data to further understand changes in the mobile landscape. 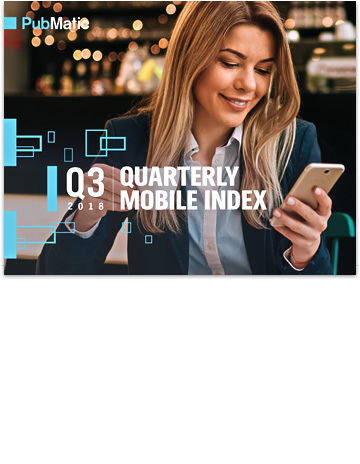 The result is our Quarterly Mobile Index (QMI) with actionable data and insights to influence media planning, inventory packaging and important insights for marketers. The report includes key insights around the growth in mobile app advertising, highlighting trends in mobile video, header bidding, and the expansion of cross-channel monetization. The newly released findings will guide publishers and buyers towards smarter programmatic strategy and projected future mobile advertising opportunities. Advertiser interest is driving global mobile video ad spend growth, creating incremental revenue opportunities for publishers. After becoming mainstream on the web, header bidding is now making strides into app environments. Evolving consumer behavior is extending advertising for the back-to-school shopping season, increasingly leveraging mobile as well. Additionally, publishers and advertisers will benefit from a look at future mobile opportunities and projected areas of growth in the coming year.